Yes, i'm familiar with github. I use it with developing Minecraft Land Generator, and I'm also using it with my Clannad and Tomoyo After diagrams I'm creating. The only issue with contributing, is that I don't know C++, which RLVM is written in. I know Visual Basic and Java... I did learn some simple C many years ago, but never used it since. I've started playing TA under wine. So far it works, but I've only gotten to the first set of questions... it will be a few days before i can make enough progress to actually play D&T. Edit: i'm currently playing with RLVM and wine at the same time. its interesting to see the differences. Wine is much faster, but RLVM looks nicer. If i didn't have my own projects already, or didnt work a full time job, i'd jump at that. The idea intrigues me though... I might poke around the source a bit. lol, yeah. Hell, yesterday i celebrated the 20th anniversary of getting my first computer. An Apple IIe, where to do anything, you had to program in BASIC. I quickly learned BASIC at the age of 7. Well, I did submit a pull request to rlvm to get the ball started on the Tomoyo After .dll issue... but its got a long way to go before anything is functional. 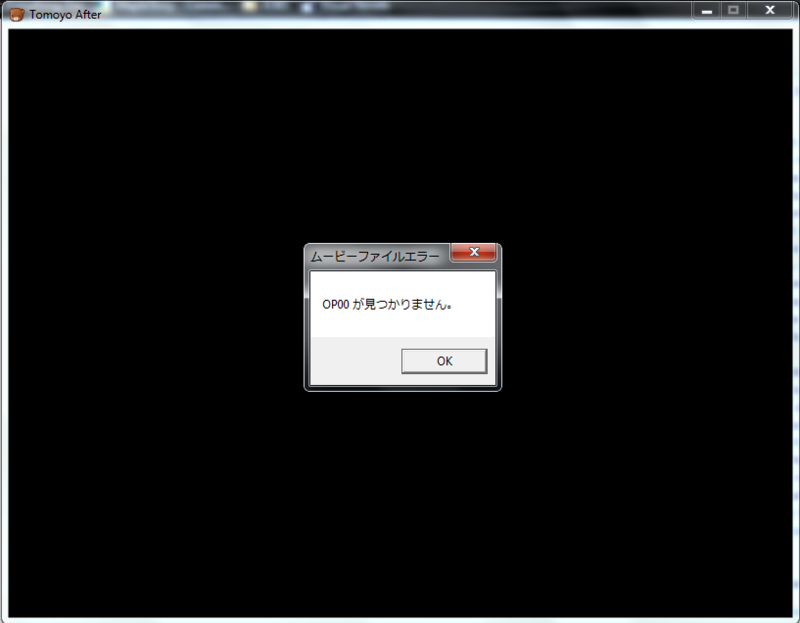 EDIT#I tried playing the japanese version of the game and the video STILL didn't load. This should be some useful information. P.S. I noticed you referred someone as "swiss" in the forums. At first I thought it was me from the future probably helping my past self but I realized it couldn't have been possible. But anyhows, my name is Swison. Nice to meetcha. Oh. At first I was confused about what you said but I think you misunderstood me. Yes, the video plays after July 2nd, I believe. I think the final dialogue before the video was "It was a rather fiery dinner." After that dialogue, the screen fades into black and then it crashes. It has happened to me every time and I don't think I'll be able to continue if I don't get this fixed. Sorry about not being specific about where it hangs. Thank you. Ah, you're talking about that bug that causes the game to crash when it tries to load the opening video. I thought you just meant you could play the game, but couldn't see the OP. Well, that problem is a bit more complicated. It has to do with your video setup. Your codecs and filters and such. Most likely your vfw filter chain has been broken, because some of the codec packs you have installed on your system have been messing with it when they really shouldn't be. How it works is a little complicated, but, basically, a vfw filter chain determines what Windows passes stuff off to for decoding first, and like anything else, it must have a default value. You don't mention what operating system you are using (always include details on your system when posting errors, as per the guidelines posted on the first page of this error reporting thread), and I'm not sure how it is with Windows XP, but Windows 7 at least has a set of native filters to handle most stuff, using its own codecs for decoding several audio and video formats, and so using third party DirectShow filters instead of the native filters is not possible without making difficult changes to the Windows Registry. The problem is that some programs and players, which are able to use third party filters just fine on their own, try to very aggressively replace Windows' native filter set with their own, basically telling Windows "Let the program decide for itself which filterset to use!". This can sometimes break games, because the game is expecting the Windows filter set to handle the video/audio, and handle it in a certain way. This way the game doesn't have to actually think about it. If Windows tells a program to choose a filterset, but the program was never DESIGNED to choose a filterset to begin with, then bad things happen. LAV for example still has some issues where in certain situations it can crash when it is called by programs as the filterset. As such, one last resort solution is to simply delete the opening video (or move it to somewhere outside of the game folder, so you can watch it manually outside of the game, using the media player of your choice). Filters can't mess up when they can't play. :-) You only said you've tried "replacing" the video, so I'm gonna assume you haven't tried deleting it. Then again, if you delete it, then you won't be able to see it when playing the game. Nothing huge of course, since you can play it manually with the player of your choice outside of the game, but there is a possible "proper" solution, if you're a little adventurous. You can download this tool: http://www.codecguide.com/windows7_preferred_filter_tweaker.htm , and then open up the prefered decoders, and make sure everything is set to either "microsoft" or "merit". Setting it to "microsoft" would probably be the best option to try out first, and then if that doesn't work, you can try "merit", though it's possible that that one may not work either. The idea is that setting the filterset to Windows, if it isn't set to it already, may fix the problem because now the game should say "Okay Windows, go handle your video thingy". It may not work, but it's worth a shot if you want, and if all else fails, you can always delete the OP video. Bear in mind though, that making these changes will affect everything else that uses your codecs as well, so use the program with caution. If it breaks everything, then you need to set things back to how they were before you made the changes. Oh I'm so sorry but I run Windows 7. I should have mentioned that. Umm I tried the tool you told me about and set it to windows. It didn't work and it also didn't work after I set it to merit. Afterwards, I deleted the video and played it and this time when the screen goes black, this message pops up. EDIT: OMG I'M SUCH AN IDIOT. WHEN THE MESSAGE APPEARED AGAIN, I THOUGHT MAYBE I SHOULD PRESS ENTER AND SEE WHAT IT WILL DO AND IT MOVED ON. THANK YOU SO MUCH. You're welcome. :-) I'm sorry I couldn't help you in such a way as to get the video to work for you in-game. So i just got the game, and after installing the English patch i tried opening it and got the error in error 1. If I hit OK, the game starts and the main screen is translated but when I hit new game the error 2 picture pops up, no text besides that repeating over and over. I looked through the thread and saw this on the first page, and so I tried downloading both the 2005 and 2008 versions, but nothing has changed. Do i need to be running run of the versions of the program while i play? Or is there anything else you know of? FYI i'm on windows 7 prem... thx in advance for any help! I'm not sure about the first error message (I'd have to get someone who can read Japanese to check what it says, since I can't tell), but from the sound of things you're still able to run the game despite it. As for the second error, the link to the 2005 SP1 (x86) version of the Microsoft Visual C++ Redistributables that Delwack included in the readme is wrong, unfortunately (I'm still trying to get him to fix that...), and you've also not installed the 2010 version, so just to be sure I'll provide all 3 of the correct links here. Make sure you install all 3. If you still get the "unable to format text" message after that, let me know. After the day ends and the application crashes, it's because of the OP (happened the same with Steins;Gate and Chaos:Head). Go to the game folder open "MOV" folder and change the video name to something else.